HomeNewsHanold Associates is Recognized as a Great Place To Work! Hanold Associates is Recognized as a Great Place To Work! Great Place To Work Institute has named Hanold Associates as a certified Great Place to Work again this year. Decades of research shows workplaces with high-trust cultures see higher levels of revenues, innovation, customer and patient satisfaction, employee engagement, organizational agility and more. 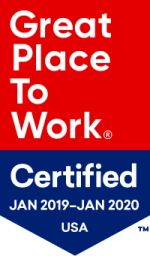 Great Place to Work certification is built to help companies get in the trust game. Great Place to Work is the global authority on high-trust, high-performance workplace cultures. Through proprietary assessment tools, advisory services and certification programs, including Best Workplaces lists and workplace reviews, Great Place to Work provides the benchmarks, framework and expertise needed to create, sustain and recognize outstanding workplace cultures. In the United States, Great Place to Work produces the annual Fortune “100 Best Companies to Work For” list and a series of Great Place to Work Best Workplaces lists including lists for Millennials, Women, Diversity, Small and Medium Companies and over a half dozen different industry lists. Hanold Associates is a boutique retained executive search firm specializing in recruiting HR leaders, serving clients such as NFL, Under Armour, Live Nation Entertainment, Patagonia, REI, Nike, UFC, Electronic Arts, Tyson, Godiva, eBay, USAA, Fossil, Amazon, Blue Apron and Vail Resorts among others.